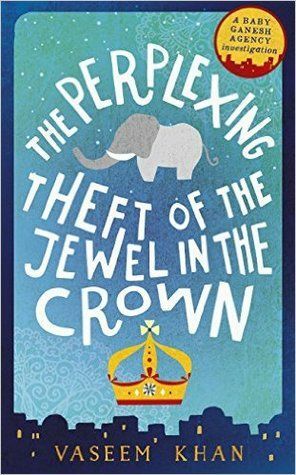 THE PERPLEXING THEFT OF THE JEWEL IN THE CROWN is a genuine treat and is particularly recommended to those looking for something other than an endless stream of death from their crime fiction. There isn’t even a murder in it. Well there’s one death that might count but I’d wager that even the most law-abiding reader would let this one through to the keeper. Inspector Ashwin Chopra (Retd), former Mumbai policeman and current private investigator, visits a touring exhibition of the Crown Jewels (yes those ones) with his wife Poppy. Before they can do more than glance at a case or two everyone in the room falls to the floor. 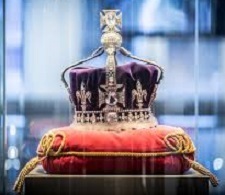 When they are woken the centrepiece of the exhibit, the crown in which the Koh-i-Noor diamond was set for Edward VII’s wife after being used in a bracelet and a brooch in during its relatively short time in British hands, has been stolen. Of course there is an official police investigation but it is being led by one of Mumbai’s most corrupt officers (refer to the first book in this series) and the prime suspect who has already been arrested begs Chopra to clear his name. It’s hard to know where to start listing all the things there are to love about this book. Perhaps the wonderfully drawn characters. Chopra is a delight. Intelligent, a little old-fashioned but self aware enough to know it. And his integrity is not a remote concept but something he lives and breathes. Which can have truly disastrous consequences such as when he refuses to pay the bribe some petty bureaucrat demands in return for allowing Chopra’s elephant to remain in his restaurant’s back yard. Ganesh, the baby elephant Chopra inherited from his uncle, has become entrenched in the Chopra family’s life and plays an important role in this story. It sounds like a silly gimmick I know but Khan does a great job of making Ganesh’s various forays into the book’s events seem perfectly normal. And I want to believe so I shall. Chopra’s wife Poppy really comes into her own here as she takes on a teaching job at an exclusive boys’ school and then has to help investigate a theft there. Then there’s Rangwalla who was fired from the police force when it became clear he had helped Chopra during the events depicted in the first book of this series. Happily Chopra’s new business venture has so much work that he can employ his old friend who proves very canny. And a star of the Chopra’s unorthodox and ever-extending ‘family’ circle is young Irfan, once a street beggar now working at the restaurant. He and his troubles will melt the hardest of hearts. Though its characters are warm and not beset by damaging addictions (cricket doesn’t count) THE PERPLEXING THEFT OF THE JEWEL IN THE CROWN is not all sweetness and light. Even without a central murder the book’s crimes show the complexities of life in modern Mumbai with corruption being as commonplace as breathing, poverty remaining a profound problem for some despite the progress of recent years and the new, wealthy class providing a particular kind of social problem. And I haven’t even mentioned the ripper yarn. There’s a clever locked room mystery, thefts galore, a kidnapping or two (well one is an elephant) and the infiltration of a meeting of mask-wearing rich chaps not bothered by the many crimes they are at least adjacent to if not directly involved with. A true adventure. I can’t imagine anyone who wouldn’t feel at least little bit better after reading this book. This entry was posted in book review, India, Vaseem Khan. Bookmark the permalink. Just think about elephants and housebreaking. One would be shoveling stuff every day. Better to get dogs or cats for pets. But I admit that I thought this elephant was cute in book one. FYI: A bulletin on Ruth Galloway. A fake news item said that “Dark Angel” is the last Ruth Galloway book. Not so. Elly Griffiths says on her Twitter that she is working on the next book. That makes my day. This sounds fabulously comforting in a difficult time! I have an earlier book by the author lined up, so must read it quickly and get on to this one.